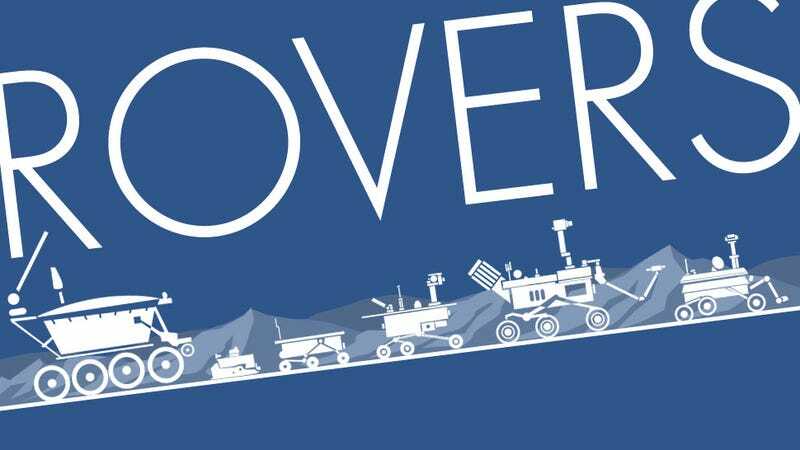 Maybe it's been the exciting, messiah-like death-and-rebirth of China's lunar rover, Jade Rabbit, but I've been thinking a lot about robotic space rovers lately. There haven't really been all that many — just eight have actually made it to either the moon or Mars. And now, for your use, are all eight collected on this handy chart! Here's the three main criteria I used to define what rovers would end up on the chart: a rover must be mobile (that means no stationary landers like the Veneras on Venus or the Huygens probe on Titan), the rover must be either remote-controlled or have some degree of autonomy (that's why I'm not counting the Apollo-era Lunar Rovers, which are really more like vehicles), and the rover must have actually made it off of Earth. The made-it-off-Earth criterion rules out any planned-but-never launched rovers like the tiny asteroid-romper planned for the Hayabusa, but allows for the ambitious-but-doomed Soviet Martian rover on skis, Prop-M. I'd actually never heard of Prop-M before, which, though tethered to the lander, managed some degree of very basic autonomy via simple impact sensors, and for 1971 was a real achievement. Too bad both of the ones sent crashed into the red dirt. The chart includes country of origin, power source, remote/autonomy status, length, weight, all the stuff you'll need for quick reference.